Thank you authors! The Flame and Wicked Game are pretty much a perfect two song setlist. I remember playing that Haken song as a 2 part custom done by some other author last year. Glad to have the full version. 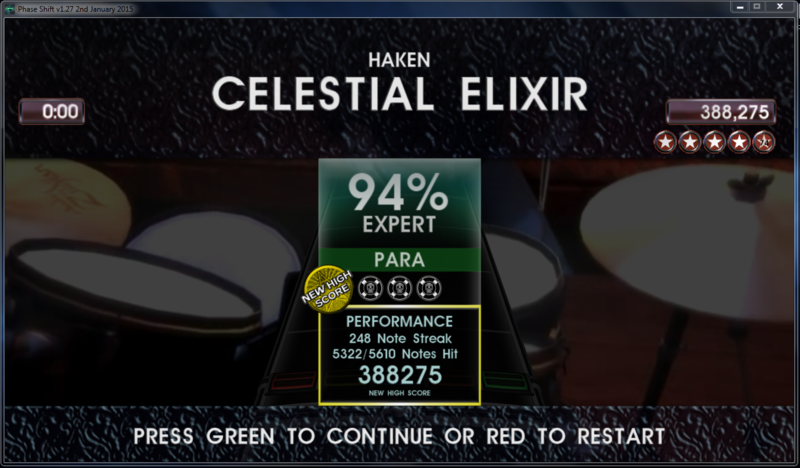 Not a big deal but the (2X Bass Pedal) version of Celestial Elixir isn't labeled in game as being (2X Bass Pedal). Thanks Bearz! Can't wait to play HAKEN! superb chris isaak, would like to see "blue hotel" too here soon. Great week. I seem to actually like variety packs best (aside from stuff that I really adore). I played and liked everything this week but the real highlight for me was the Haken song. I actually was not familiar with this band but I'll never be able resist the words "17 minute prog song". Coincidentally, with it's "circus music" influences it was probably the second best possible companion release to the live show of the legendary weird metal band Arcturus in Helsinki this past weekend. Great to see Wicked Game on here. I played it and noticed a few quirks. For example, every other note on guitar is a mini-sustain for some reason, different from the preview that had all those notes be regular notes. I know that preview charts are subject to change, but something like that seems like a mistake to me instead of an addition. Both the CON file's midi and the Phase Shift file's midi show the same thing. Also, there's a typo in the first line of Verse 3B. The lyrics say "I never dreamed that I'd need somebody like you," when in reality the singer actually said "love" instead of "need." Other than that, I liked what I saw and played. Will move onto the Haken song and maybe a few others. On the top of the forums page, there's a link that says "Report Song Issues." This will lead to what is called the Bug Tracker. Just submit a ticket there, and the author will be notified of the error. I fixed the lyrics but I can't see any issue with the guitar, which I tested myself and which wasn't touched after the recording. never heard this before but really enjoyed Haken - Celestial Elixir. Great fun on x-pro drums. those keys sound cra-azy whilst i was playing it. Srsly, how many days\weeks\months\years charter spend on such brilliant song? It's perfectly synced.